This post is in partnership with World Market. All thoughts are 100% mine. For those of you who are new to my site, Welcome! We moved across the U.S this past fall and purchased our first home. In the process of moving, we gave a ton of furniture away, including my beloved work desk. Instead of rushing the whole moving process, we decided to take our time. But how can you take your time when you have kids, they have needs and you have work that needs to be done. With that said, we were in desperate need of a quiet space where my kids can work on homework without being disturbed. As much as I like to say, I planned for this space to get all dolled up after moving in, I didn’t. I actually did not start thinking of an office/study until I realized that my kids needed somewhere quiet to do their homework. I know, I am bad. 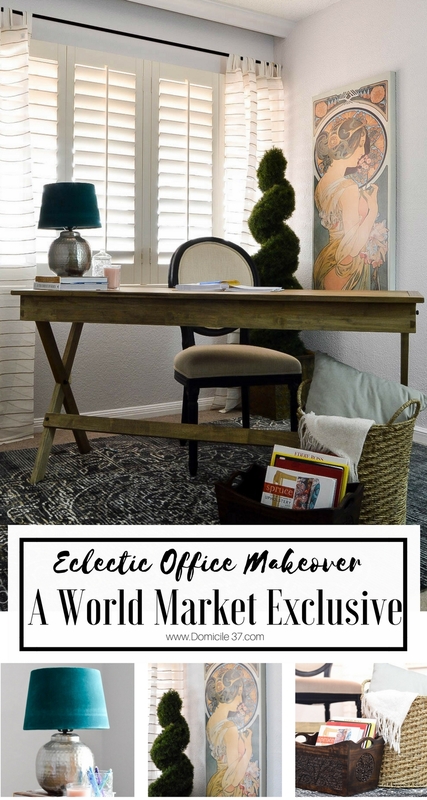 So when World Market approached me to do an office makeover, I was game! Catch was I had to stay within a certain budget ($1200). Not a problem here, because budget is my middle name! Haha! To make this happen, I decided to take our third bedroom and turn it into a make-shift office/study. This room gets a lot of good light and is one of the only rooms in my house that has a soothing, non-dramatic feel. So, it was perfect space to use to create an office. Many businesses have started employing people to work at home as this eliminates the need for them to invest money in buying an office unit for their employees. The will save the business lots of money and may save them from having to organise a merchant advance. If you are wondering, what is a merchant cash advance? You should check out Delancey street to find out how to get merchant cash advances fast! With three kids in tow, a budget is always established with every room makeover. I was able to find most to everything for this room at World Market for a great price. The items I did not purchase at World Market, I already had on hand. The one thing you can bet on is that they always have some kind of deal going on. If you are a rewards member that is more of a plus for you because you can stack those rewards on whatever sale they have going on. This is what I did, it was a win-win in my books! This campaign desk is a desk that I have been drooling over for a while and looks perfect when mixed with this Blue Medallion wool rug. I am not really one to match my furniture, so I knew that wanted a good mix of wood, texture, and pattern. 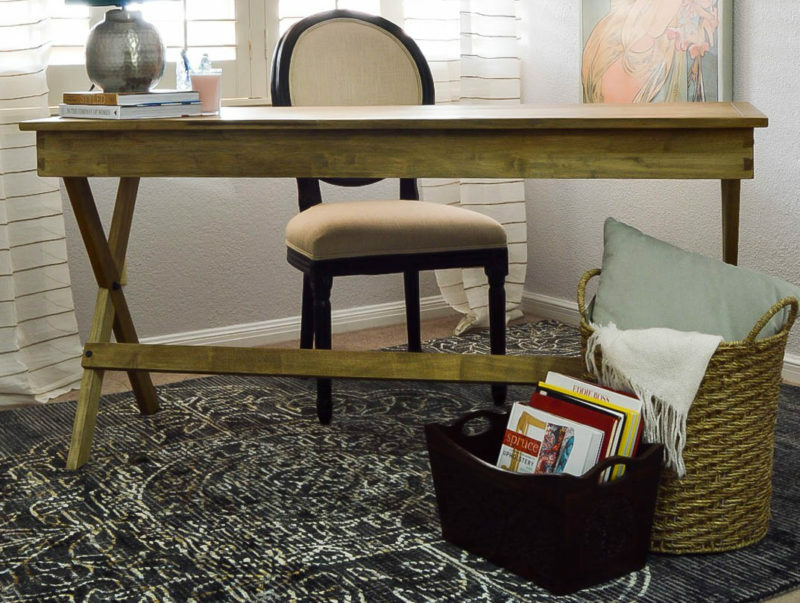 This rug, is really soft and nice to lay on, but it has a variation of hues that complements the finish of the desk nicely. 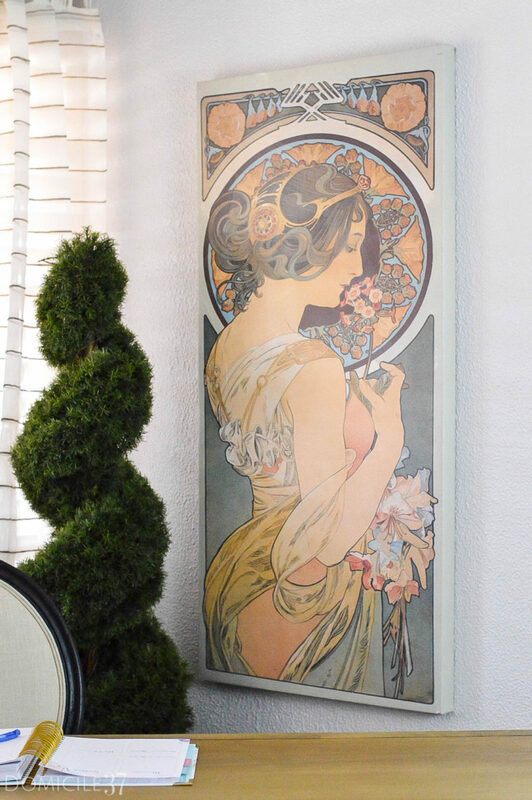 The curves in the rug pattern also match the Art Nouveau print. That print could make a room look overly feminine, but the other elements and finishes give it more of an eclectic, classic flair. 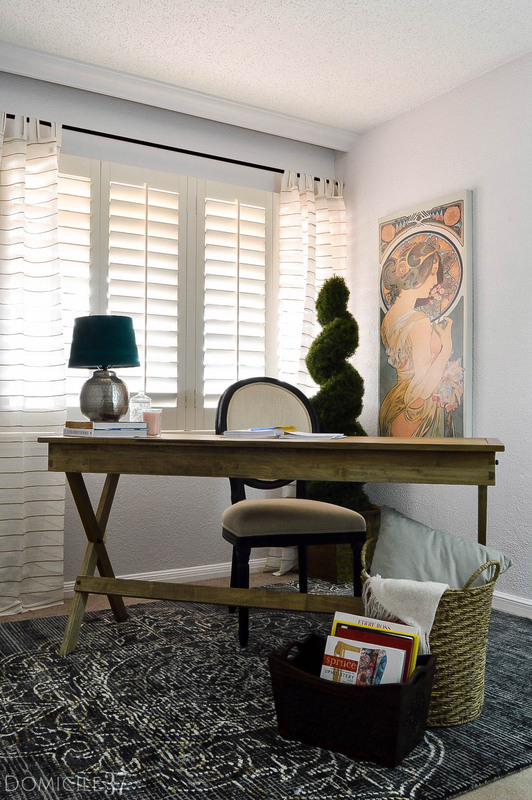 The striped jute curtains soften the window, while still allowing light to shine through. Seriously, this is the perfect, cozy office space. My kids like to come in here with their books and they can sit for hours just reading. 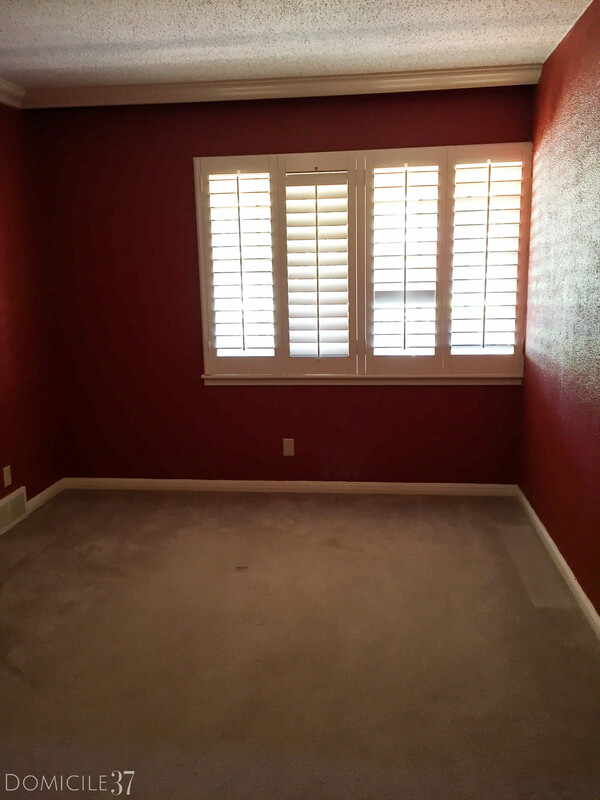 I chose to go with dining room chairs for this space, because I was getting two chairs for a steal of a deal. This is approximately five feet long so both chairs fit here comfortably allowing for more than one person to use the desk at a time. If dining chairs in your office isn’t what you are after, looking into the top chairs on the market for offices specifically may be a good idea. I have small kids, so this is plenty of space for them to work. While I am working in here, I can easily store the extra chair to the side so that I have more workspace. If I ever choose to soften the look of this room, I could always incorporate some of World Market’s New collection called Jardin Anglais, there are a lot of white ornate decor that would look great against the Art Nouveau print and Blue Medallion rug. 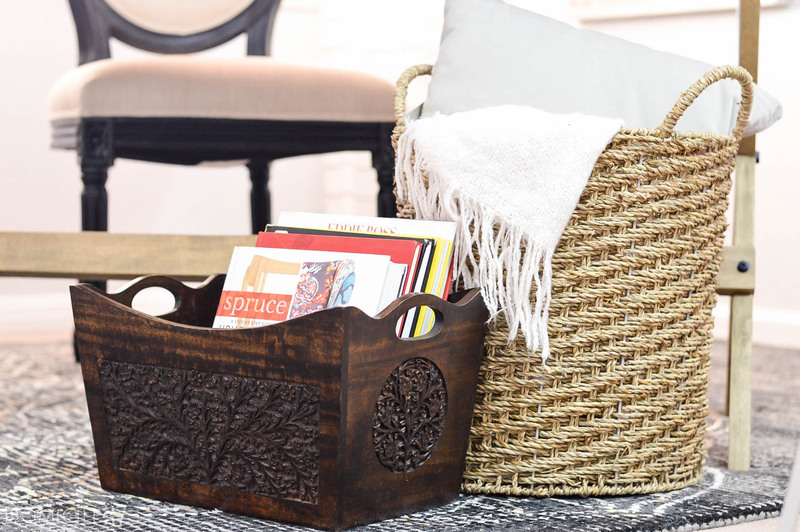 I did not want to break the bank on accessories and I really did not want this space to be your typical office space with places to stash clutter, so I kept it simple. I really wanted this to be a space that I can use when the kids are at school and a place that was also kid friendly. I realized that when I have too many compartments or places to put stuff, my kids like to use it to store their junk. This year, I am trying to make changes and be more organized and only buy what we truly need. Back to not breaking the bank, I discovered that one of the coolest areas in World Market to shop is their kitchen and bathroom department. They have so many little knick knacks and containers that can be used for essentially anything. I found this cute glass canister for less than $10. It has Moroccan inspired detail and adds subtle pattern to the setup without going over the top. One of the things I like to do when decorating is using glass or acrylic pieces to lighten the space. I knew I would be storing pencils and pens in here so instead of looking for something colorful or with a heavy base (i.e. ceramic) I chose this glass container. I also really wanted a metal base object in the room to kind of anchor the space. 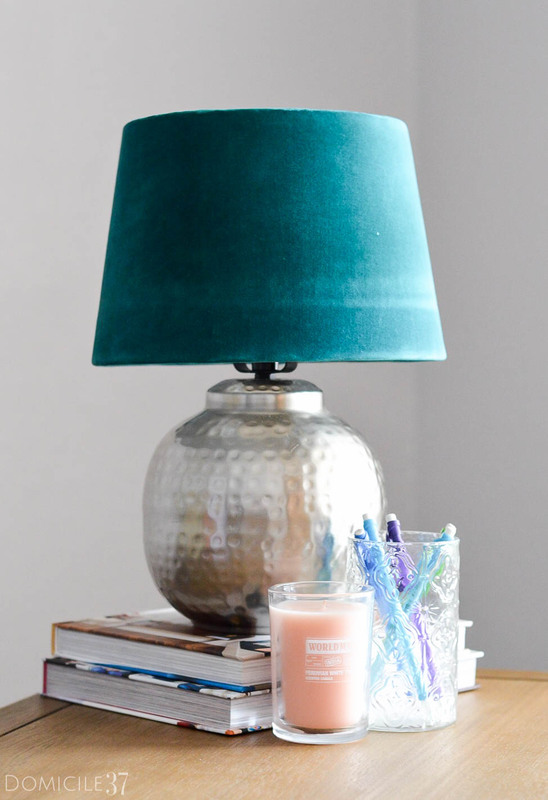 I did not want to buy a metal base table (they had some really nice ones to choose from) because it would make the room feel crowded, so I picked up this lamp and topped it with a velvet shade to kind of anchor the space and give it some color. Also, the light comes in handy in the evening hours. Do not be fooled by that velvet shade, it lets out a good amount of light. I needed a basket to house my throw blanket and pillows because I am always cold and I have a bad habit of stealing the blankets from my room and dragging them around my house only to not remember which room it is in. I found this basket for less than $15 in the laundry aisle. It is nice and sturdy and the perfect size to use as an oversized wastebasket or for storage. Since owning my own home, I am learning that quality is better than quantity. I could not pass up on the opportunity to buy this carved wood magazine holder that I am clearly storing my design books in. It is extremely beautiful and the detail on in it is perfection. It is a solid build and well worth the price. Remember, creating a space does not have to cost a fortune. Look for items that are well-built, functional, and aesthetically pleasing. Your home is your temple, so style it the way you want it. I hope that I inspired you to think outside of the box when decorating your next space. 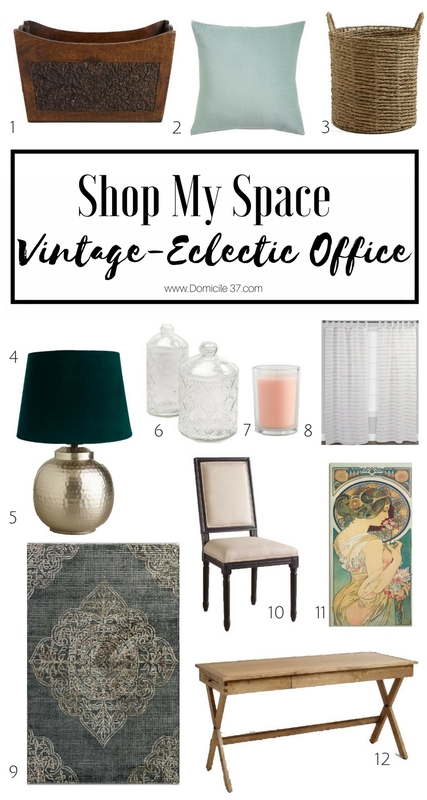 If you are interested in anything that you see in this room, check out my “shop this space” board. I would like to give a huge shoutout to World Market for helping me put this room together, Thank You so much!!!! Jess, that’s a beautiful workspace you created! The rug really grounds the room. I would never guess that the wall art is from World Market. Love all the textures you incorporated! Thanks! The rug is gorgeous and like you said, really grounds the room! Looks amazing girl! You have such a way with maximizing decor and budget. The way you pull it all together always blows my mind. You’re so talented friend! That art nouveau print is amazing! I’ve always had a soft spot for that style/era! Love everything you chose for this space! Such a lovely space! What color did you end up painting the walls? Yep, it really does. I love the lampshade! thanks for stopping by.